Exclusive! 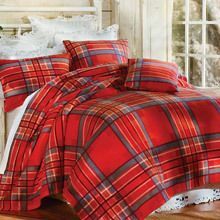 These Emerald Plaid Fleece Blankets & Accessories are a great option for crisp nights! Whisper-weight brushed polyester fleece. Super-soft and easy-care. Machine wash. Imported. Bought one last year and loved the warmth with such a lightweight cover. The quality of the fleece is not top notch but acceptable. Thanks Paragon for such different products. "I bought this in king, plus the shams & pillow cover. I the way it feels and looks. It makes my bed warm & cozy. "